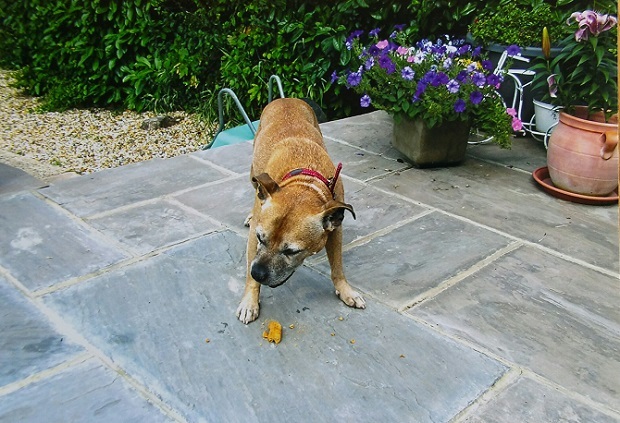 14/03/19 – Bailey has moved into his forever home and we’re all thrilled for him! Congratulations beautiful boy! 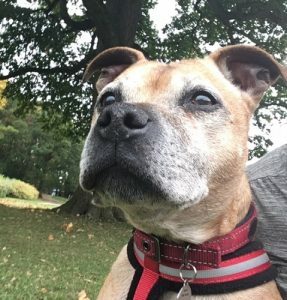 Bailey is a heroic golden 13 year old Staffy boy who came into the Oldies Club dog rescue from a stray kennels after being found tied to a lamppost. He was extremely stressed in kennels and arrived there with a hoarse bark from being abandoned for who knows how long. 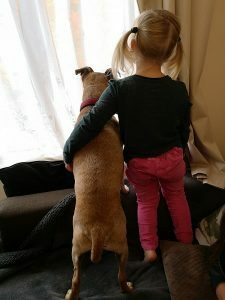 Although he had temporary respite care away from kennels, he was starting to shut down and had been found on a number of occasions just standing facing the corner of his kennel. It was a desperate situation for poor Bailey. And there is further drama attached to Bailey’s story prior to him coming into the Oldies Club… You might be wondering why we are referring to him as a hero. 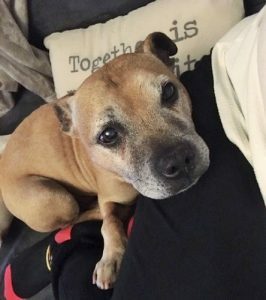 The reason is that, one nighttime when he was in temporary respite care, clever Bailey alerted his carer to a serious fire in a neighbour’s garden. You see, Bailey really is a hero! You can read the story of Bailey’s heroism on the BBC website here. After hearing of Bailey’s plight, Oldies Club were very happy to be in a position to offer him a place with our rescue. He is now in a foster home in Wiltshire, but he is still waiting for someone to offer him a loving permanent home. 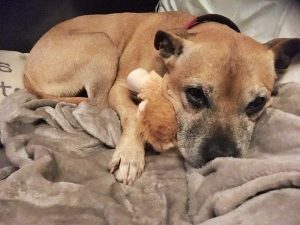 After all that drama, below is the regular information about Bailey from his Oldies Club foster mum. 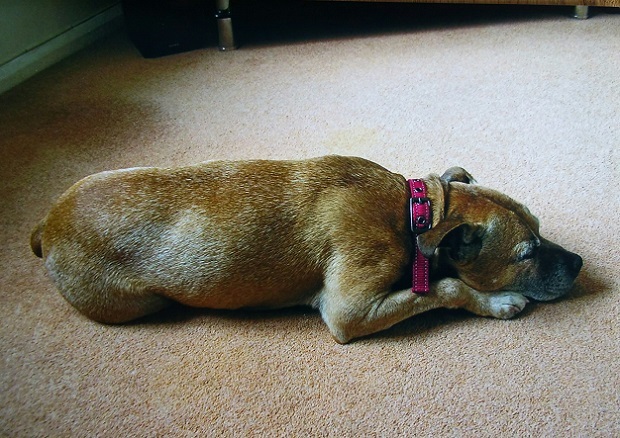 Settled within a few days: Bailey settled at his foster home within 3 to 4 days. 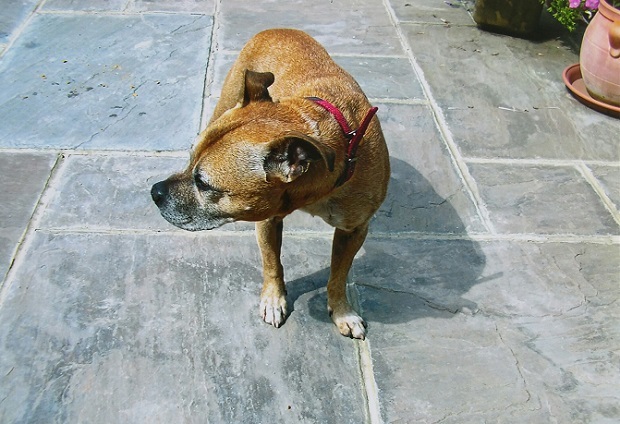 Loves company: Bailey is currently being left for a few hours because his foster carer works part time. She tucks him up with a blankie and teddies but he really doesn’t like being left. We think Bailey will only be happy if he has someone to be with most of the time. 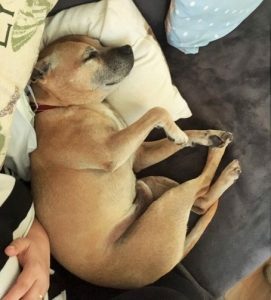 OK with some dogs but would like to be your only one: Bailey needs a home where he is your only dog. He is OK with some dogs when out and he seems to prefer small dogs. He doesn’t like it if off lead dogs run up to him and will grizzle to tell them to leave him alone. He finds big dogs really quite scary. Will chase cats: Bailey needs a home without cats. 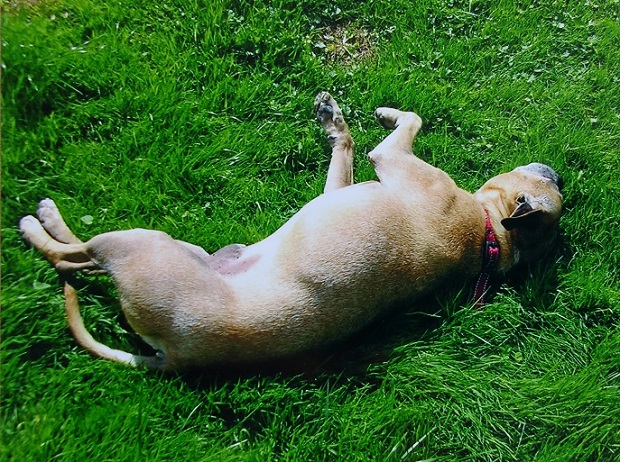 Good with children: Bailey has proven to be very good with a 6 year old and a 3 year old. He loved the attention and extra cuddles. He could possible live with dog savvy children and would certainly be happy with visiting grandchildren. Such fun! Enjoys walks: Bailey is good on the lead. He’s partially deaf so he has stayed on his lead. He is currently having three walks per day of 20 – 30 minutes each. Very good in the car: Bailey is well behaved in the car. He seems to love it and often drifts off to sleep. Bailey’s favourite pastimes: Walking, eating, playing in the garden, helping with everything around the house, and cuddles! He loves greeting visitors too. He’ll bring people a teddy to say hello and if he can’t find a teddy, he’ll bring a shoe! Such a considerate host! His absolute favourite thing is to be snuggled up to you on the sofa! Bailey’s dislikes: He jumps if you touch him when he does not know you are there, maybe because he is deaf. 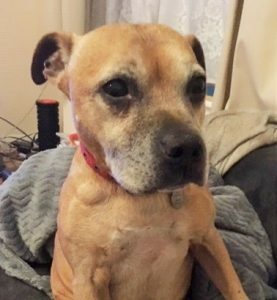 Bailey’s ideal home: He would love a home where he can spend lots of the day with you, pottering around and helping with the housework and gardening. 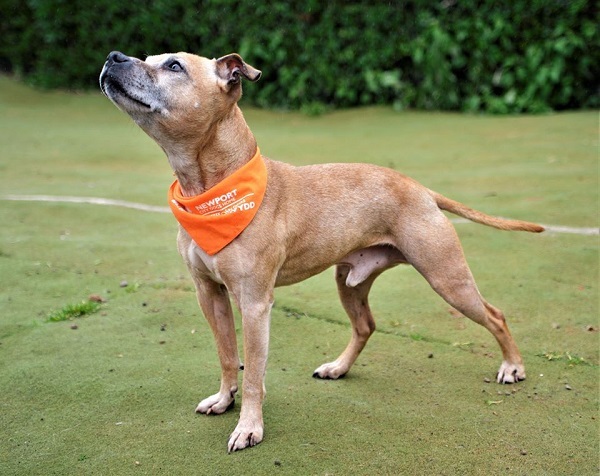 He would particularly love a retired person or a home worker who will give him plenty of love and attention. Visiting grandchildren would be lovely for him! Health notes: Bailey is neutered, vaccinated, microchipped, and has been wormed and flea treated. Other than a touch of deafness, Bailey just has some mild arthritis in his back legs but this needs no treatment at present. He can run and jump without problems. 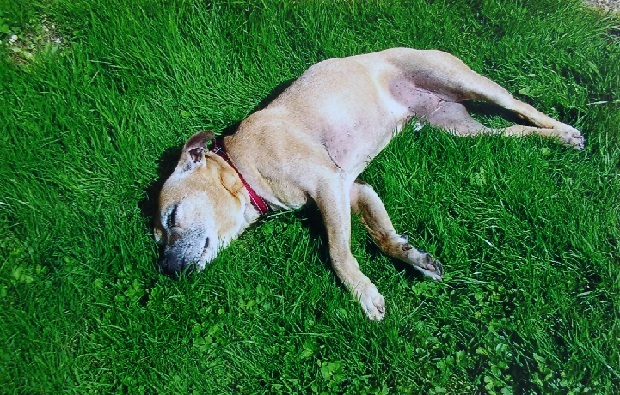 Could you add the final happy chapter to Bailey’s story? 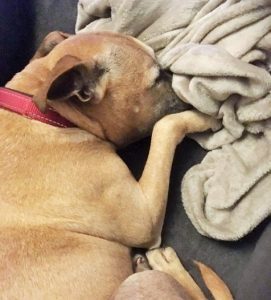 Bailey can be rehomed anywhere on the UK mainland, subject to a satisfactory home visit, but note that you will be required to travel to the foster home to meet him. 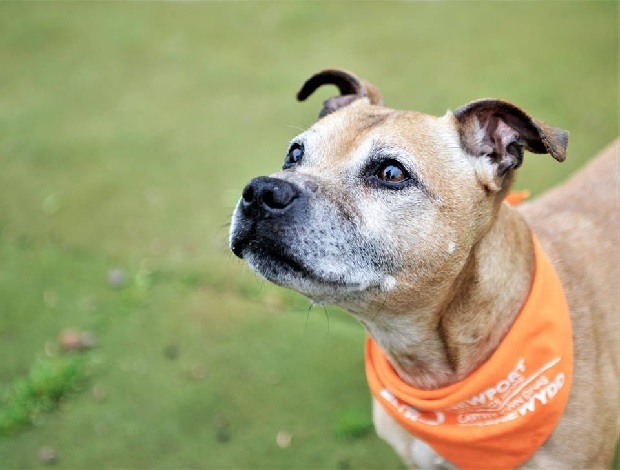 If you would love to offer a home to an oldie but your circumstances aren’t suitable, perhaps you would be kind enough to sponsor one of the special oldies we are caring for that, due to health problems, are unlikely to be offered a permanent home.